Limited seating available for this session! Participants will be provided the APICS CLTD course reading material and one-year access to the APICS online courseware. Continental breakfasts, lunches, refreshments, and internet access is provided as part of the on-site course. Please note that the course fee DOES NOT include an exam voucher which can be purchased separately/later through APICS Atlanta. This accelerated learning boot camp covers 2.5 days of instructor lead facilitation and is designed to cover key learning points of the CLTD learning system. The learning system content is included in the course. This boot camp is intended for the self-study learner planning to take the APICS CLTD certification exam. 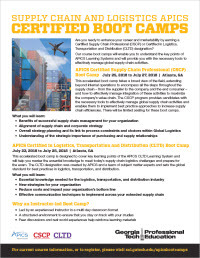 The APICS Certified in Logistics, Transportation and Distribution™ (CLTD) certification provides you with the information you need to meet today’s supply chain logistics challenges. Participants will gain an understanding of the processes, best practices, and tools used by today’s logistics managers and how to design and administer systems to control the movement and positioning of material and information flows to satisfy customer requirements at the lowest total cost. Participants will be provided the APICS CLTD course reading material and one-year access to the APICS online courseware. This course provides for 1.75 continuing education units (CEUs). Standard: $2,400.00, Alumni/Org Discount: $2,160.00, Certificate: $1,992.00 (cost of each course when signing up for and paying for a multi-course certificate program). 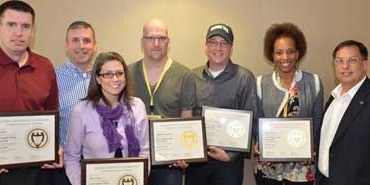 First time attendees pay the listed Course Fee. 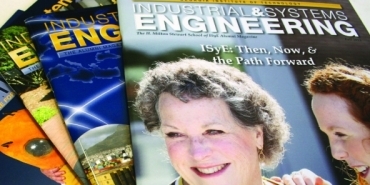 If you are a returning student of the Supply Chain & Logistics Institute (SCL) courses (or are active/retired military), you will receive a 10% discount when you enter the coupon code SCL-Alum on the "Check Out" page. 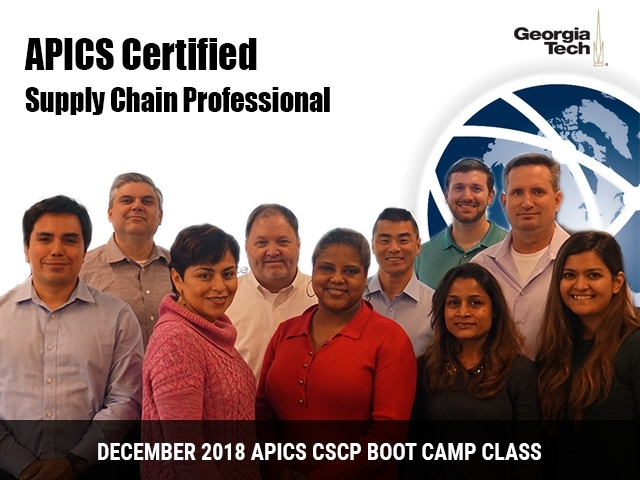 If you register and pay for all required courses in a Supply Chain & Logistics certificate in one single transaction, you can receive a discount of 17% off each course by entering the coupon code SCL-Cert on the "Check Out" page. There are also discounts available for multiple-team member registrations or to members of certain organizations. The program fee for LIVE courses (non-online) includes continental breakfasts, lunches, breaks, parking, internet access, and all classroom materials. If the Supply Chain & Logistics Institute must cancel a program, registrants will receive a full refund. 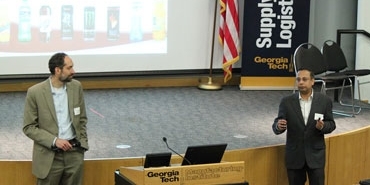 Georgia Tech, however, cannot assume the responsibility for other costs incurred. Due to program enrollment limits, early registration is encouraged. Registrations will be acknowledged by a letter of confirmation from Professional Education. On the first day, please check in at least 30 minutes before the class start time. Every effort is made to present the course as advertised herein; however, circumstances may make it necessary to alter the schedule and/or presenters. 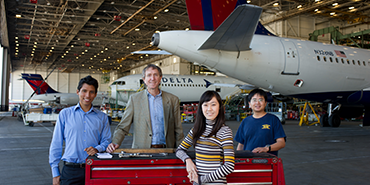 Taught by Chris Barnes (center-left), SCL professional education instructor and current APICS Atlanta President.